Without doubt, the single most important thing that a homeowner can do to prevent a break and enter is to properly secure the perimeter of the home - done by means of a number of inexpensive and simple physical security precautions. 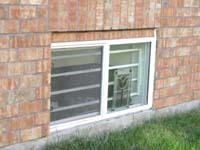 Basement windows are best physically secured with window security bars. Add contacts on basement windows on your alarm system, and the combination of physical and electronic measures almost guarantees you will not be bothered at these points of entry. Inside mounted with integral key lock on each window for safety and ease of access. Pricing (including installation) in the Ottawa area only, and ONLY for my alarm customers. This page last updated Saturday, November 20, 2010 . These prices are only slightly above dealer cost as a courtesy to my alarm clients. We do not install these for other than our alarm customers due to sheer workload. Should you wish to install your own bars, very inexpensive ones are available from Rona or Home Depot from $20 to $60 whjch will do the job.